How long have you been in the hotel industry? Eight and a half years. 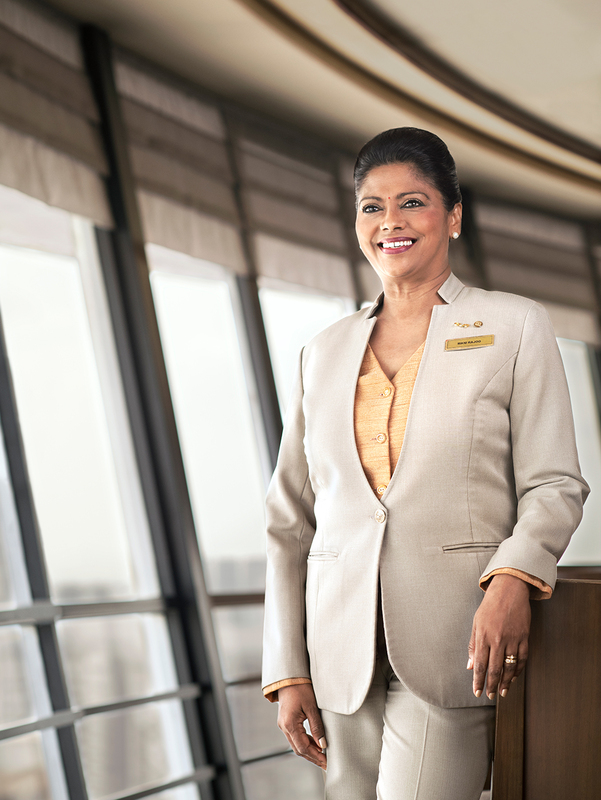 What made you choose to join the hotel industry? I was in the aviation industry as a cabin crew for 27 years. I decided to take a break for a year to spend some time with my family. During that time, I had the opportunity to join the hotel industry in the Food & Beverage (F&B) Guest Services department. I thought that the hotel industry would be a good fit since I had prior experience with serving guests. But it also offered new challenges that allowed me to learn and grow. My main responsibilities were to interact with diners and get their feedback, which was something unique to Mandarin Orchard compared to other hotels at that time. How has your journey in the hotel industry been like so far? I’ve thoroughly enjoyed it. After about six months in the industry, I was reassigned to be an assistant restaurant manager and I learnt quite a bit. I spent a lot of time interacting with guests and staff at the restaurant, which I feel is something that I’m good at, given my past work experience. Unfortunately, four years later, I had to undergo a surgery on my leg and I could no longer stay on my feet for long periods of time. I now handle reservations, which is a desk job, but I’m still glad to be here. Can you tell us more about your role and what you do on a daily basis? I still get to have guest interactions – just that now, it’s mainly over the phone. Occasionally, I’ll come to the restaurant to meet our regular customers or oversee any events. But most of the time, I’m taking calls from customers who want to make restaurant reservations or have enquiries. I also provide daily updates to the hotel’s F&B management – such as what events we’re holding and how our promotions are doing. What do you find most fulfilling about what you do? Nothing beats the feeling of being able to help someone, and then seeing how grateful they are for what you’ve done. Sometimes, guests might call in at the last minute to try and get a reservation, or maybe they can’t really speak much English – but my team and I still do our best to assist them. Once, I helped a guest who called to inform the restaurant of his beef allergy. I recommended alternative dishes for him to consider, and I even had the chef create a customised set menu to work around his allergy. The guest really appreciated my help, and even wrote a commendation letter to the hotel! What keeps you motivated at work? Customer service is my passion. I draw inspiration and motivation from knowing that I am able to make a guest happy. I get a deep sense of fulfilment when guests take the time to compliment or thank me personally for the help I offered them. It really lifts my spirits and makes me feel like it was worth all the time and effort. You spent 27 years in the aviation industry and eight years in the hotel industry without receiving a single complaint. How did you manage to accomplish that? I treat every guest or customer like family. And everything I do – even the smallest thing like smiling at them – I do from the heart. Of course, I have to be patient and willing to listen. Only then can I help them and make sure that everything they needed is well taken care of. It’s a lot of hard work, but my passion for service and creating happiness helps me get through it. Is there anything that you learned from being in service and hospitality that has served you well even to this day? One tip I’ve learnt from my time as a cabin crew is that once you’re able to please the elderly and the children, the whole family will be impressed. But apart from that, it’s really about being patient and confident in what you do. I approach all my tasks with a positive mindset, and that positivity really spreads to my guests and my colleagues no matter where I work. Do you impart any lessons or experiences to the people you work with? Sometimes I do. My experience in the aviation industry is not always directly applicable to what we do in a hotel restaurant. But wherever possible, I will tell my team to embrace challenges and face them head on, because that’s the only way to continue learning and developing. I also remind them to always deal with guests with utmost sincerity and genuine care. What advice would you share with someone who is interested in joining the hotel industry? The industry is full of surprises, so you should expect the unexpected. Be patient, try to understand the guests, and enjoy what you do. It is truly a fun and fulfilling industry to work in.